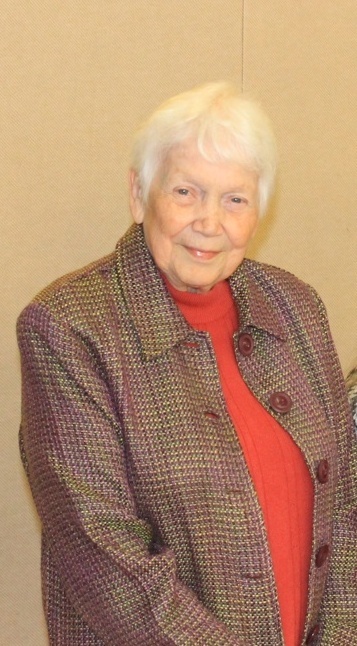 At the Fall 2013 OPA Conference in Forest Grove, Ruth F. Harrison was honored with a lifetime membership. In tribute to her, “Ruth Harrison: An Appreciation” was presented by Eleanor Berry, OPA President Emerita. Over the past dozen or so years in which I have been active in O(S)PA, it has been my privilege to get to know many fine poets and capable workers on behalf of Oregon poets and poetry. One who has seemed to me—and to many others—an extraordinarily luminous presence is Ruth Harrison. To the best of my recollection, it was at one of the first OSPA conferences I attended that I met Ruth. I remember that she was standing by me in the lunch line, and that we fell into conversation. I remember being drawn to her quiet intelligence and warmth. All the subsequent occasions I’ve spent time with Ruth or her poetry have reinforced that first impression. When I met her, she had retired from her career as a teacher of medieval literature and was fully immersed in poetry and deeply at home on the Oregon coast, where she lived with her husband, Fred, who shared both those passions. As I came to know Ruth and her work, I realized that, for her, poetry has been strongly associated both with the coast and with community—with a creative community that she has fostered there and a dispersed community in which she has participated. She has been the central energy of the exceptionally long-running writing group Tuesday, which has been an almost legendary nursery of creative verbal work. Ruth has also been active in the National Federation of State Poetry Societies (NFSPS), submitting to and winning its contests—including the top one, the prestigious Founder’s Award—and often serving as a judge. She has also corresponded with and contributed to publications edited by poets across the country, among them, Florida poet and past NFSPS president Madelyn Eastlund and well-known expert in poetic forms Lewis Turco. Through her own poetry, she enters into lively conversations with past poets as well. Ruth’s poetry is often in fixed traditional forms, but that doesn’t mean that it expresses worn-out sentiments in archaic diction. Far from it. In her hands, these forms become vehicles for fresh observations and connections articulated in contemporary colloquial language. Who except Ruth would think to write an Italian sonnet on the laundromat as a refuge from life’s ordinary disappointments and frustrations? Who except Ruth could pull it off? Who except Ruth would think to write of a lone stray or feral cat in Sapphics—and produce a cat poem marvelous and memorable enough to rival William Carlos Williams’s entirely different small masterpiece, “As the cat …“? Some years ago, I invited Ruth to be one of the featured poets at a Stafford birthday celebration in Salem. I think it was then that I learned that Ruth, like Stafford, had grown up in Kansas. On the evidence of these two poets, Kansas seems to be a place that breeds a long gaze and a wide imagination and that allows no shred of pretension. At first blush, the central Oregon coast may seem a long way from Kansas, but it strikes me that it is an environment that would tend to reinforce that breadth of vision and modesty of manner. Certainly, Ruth, in her poetry and her person, suggests as much. Recordings of Ruth reading several of her poems, together with texts of the poems and a brief biographical note, can be found at http://oregonpoeticvoices.org/poet/294/. Her more recent work includes How Singular and Fine (2012) and West of 101 (2013), and also the most recent of the anthologies produced by her writing group, Tuesday: An Anthology from the Central Oregon Coast Writers Group (Vol. 5, Winter-Spring 2010-2011).